Rev. 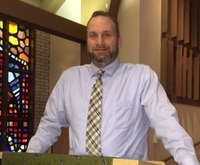 Jeff began his ministry at Parkwood in March 2006 after serving seven years as minister of Brockway (Pennsylvania) Presbyterian Church. He was born and raised in Leechburg, PA, the oldest of 4 children. He attended Clarion University for undergraduate work and received his Master of Divinity degree from the Pittsburgh Theological Seminary. Jeff was ordained on April 6, 1997, but has been serving the Church since 1993. Jeff is the father of 3 very active boys: Cameron, Carson and Caleb. When Jeff isn't at the church, most of his free time can be found coaching the boys on the baseball field or being a "glorified Uber" for them...without pay! Jeff is a die-hard sports fan, specifically when it comes to his hometown Steelers and Pirates. When he finds any free time, he can be found spending time with the boys or out on the golf course practicing for future runs at a green jacket. What is your favorite verse of scripture? Why? Jeremiah 1:4-10, because God calls us even when we think we aren't good enough. If you could have dinner with one Biblical figure (besides Jesus) who would it be and why? Pontius Pilate, to find out what his thought process was.